How did Sydney get to work in 2006? 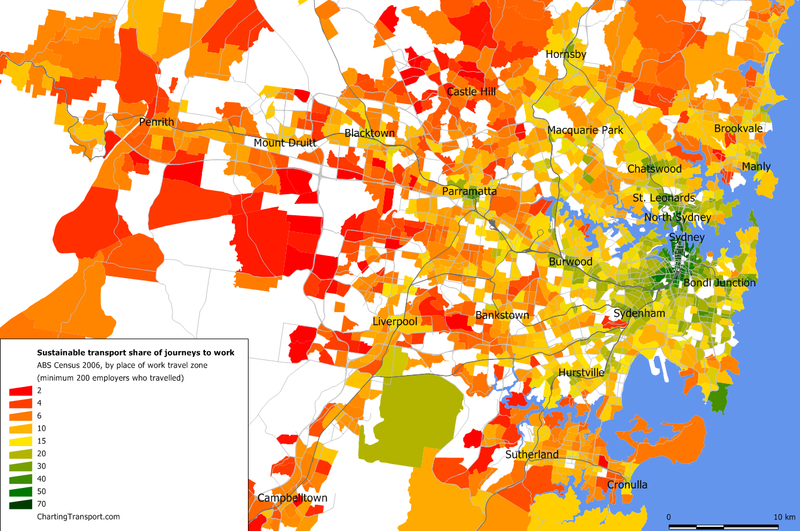 With the imminent release of 2011 census journey to work data (30 October 2012), I thought it would be worth completing a look at 2006 data for Sydney and other cities. 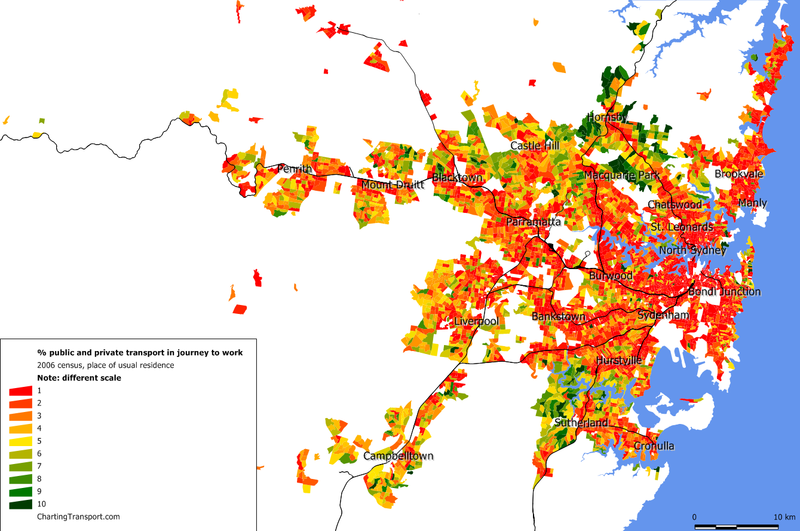 This post will take a more detailed look at Sydney, thanks to the free data provided by ABS and the Bureau of Transport Statistics New South Wales (BTS NSW). 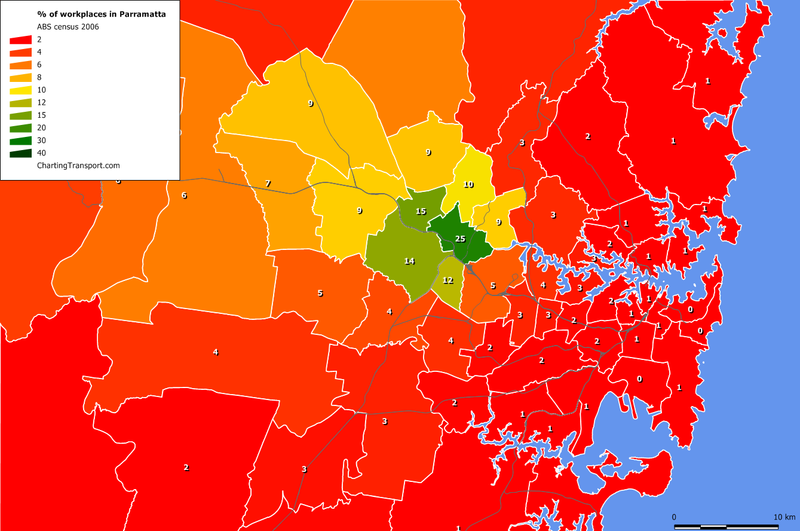 In future posts I hope to look at Adelaide, Perth and Brisbane in more detail, and also compare 2006 and 2011 results. Public transport: Any journey involving any public transport mode (private transport might also have been involved – eg park and ride). Active transport: A journey that only involved only walking and/or cycling. Sustainable transport: Public transport + Active transport (note: this includes private+public journeys, but not private+cycling journeys). 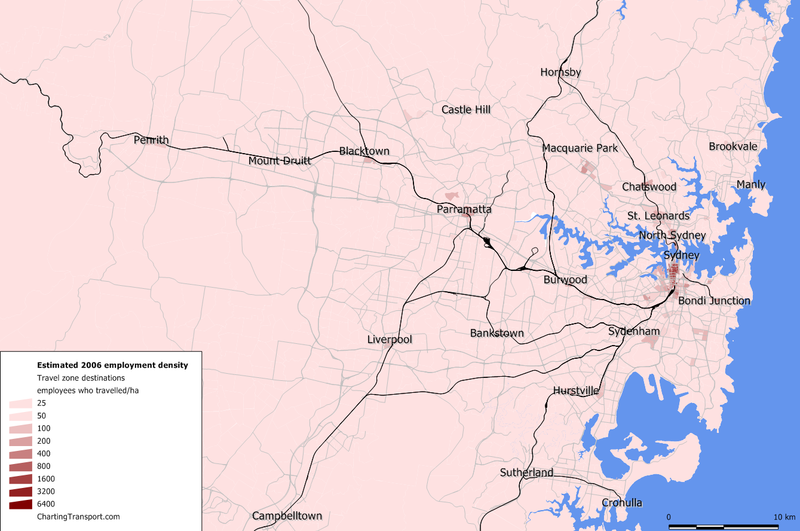 Also, I have included railway lines on the following maps, however the data I have is unfortunately quite old and doesn’t show the CBD area rail network or the airport line (the Epping-Chatswood line was not operational in 2006). Data is readily available on journey to work by home census collection district, however this is by place of usual residence. Ideally mode shares should be measured using place of enumeration (where people actually were on census night), but I haven’t forked out the $750 required to get access to ABS TableBuilder Pro which would provide that data. So the data I’m presenting is not ideal as some people would have been away from home on census morning and their modes of travel will be associated with their usual residence. But the data still provides a fairly good feel for what happened as most people were probably at their usual residence, and hopefully most people filled out their forms accurately. 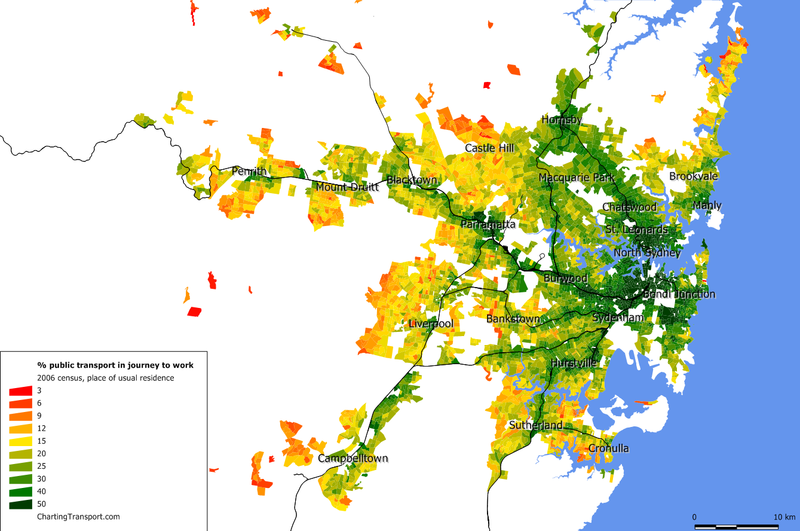 Sydney is a sea of green on this map (other cities will have the same colour scale, stay tuned!). Public transport use in journey to work was highest in the inner city area and along the train lines. It was lowest in the outer suburbs beyond the rail lines. 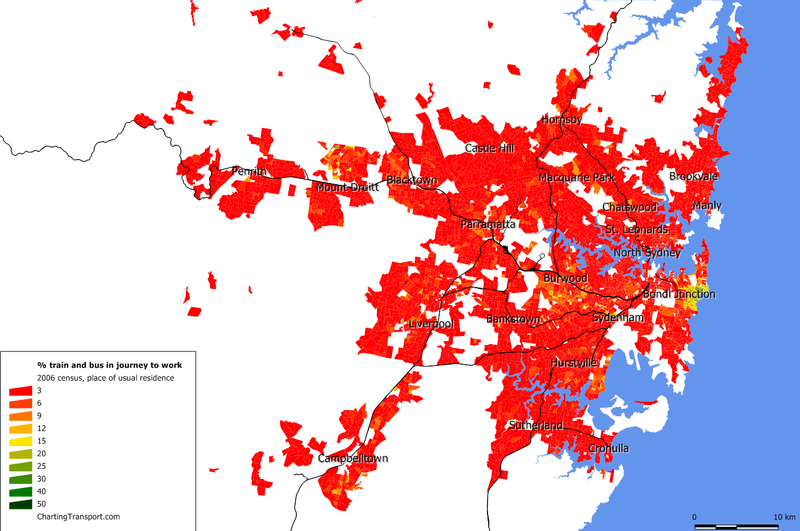 There are three large and stark areas of red near the CBD and close to train lines. Most of these areas are served by direct and frequent bus services to the CBD, and while for some it might be quicker to change onto a train, this would probably be more expensive. Also, the area around Castle Hill has very low train mode share, although we will see shortly that of the small number who do commute to the CBD about three-quarters use public transport. I note that the airport rail line (not drawn on the map) resulted in a high train mode share at Mascot but not at Green Square. 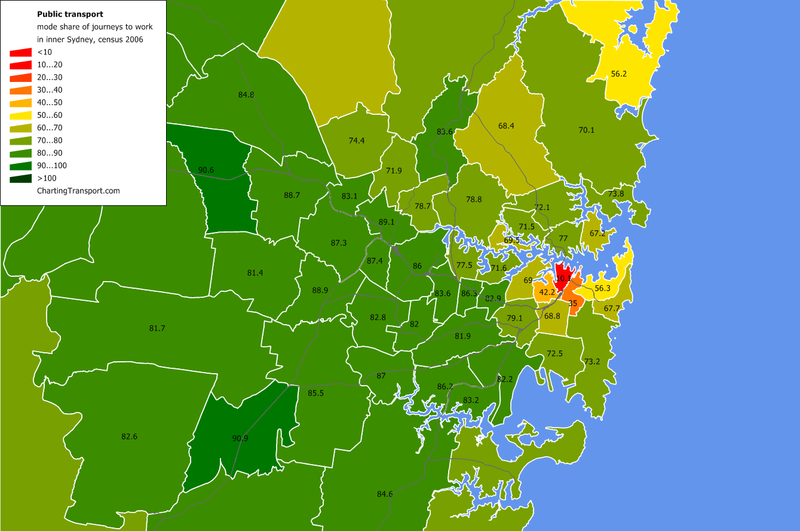 Bus mode share was high in the suburbs close to the Sydney CBD, but very low in the outer suburbs (with exceptions around Palm Beach in the north, Castle Hill (served by freeway buses), and seemingly random pockets north of Mount Druitt). I’ve used the same colour scale as other maps, and so most of the city is red indicating very few bus-train transfers. The curious exception is around Bondi Beach/Bronte. This is probably all to do with the special Link Tickets that allow bus and train travel on the one ticket in this area only. They are designed for people visiting these areas, but they seem to be very popular with locals travelling to work. I do wonder what would happen if there were valuable integrated tickets for more places (perhaps we’ll see some differences for 2011 thanks to MyZone). I’ve zoomed into the harbour for this map, and included the ferry wharves (some receiving a much more frequent peak period service than others). Use of both public and private modes is most common in the northern suburbs around Hornsby (areas away from the train line), around Macquarie Park (now served by rail), north of Blacktown (now serviced by bus rapid transit), and west of Sutherland. 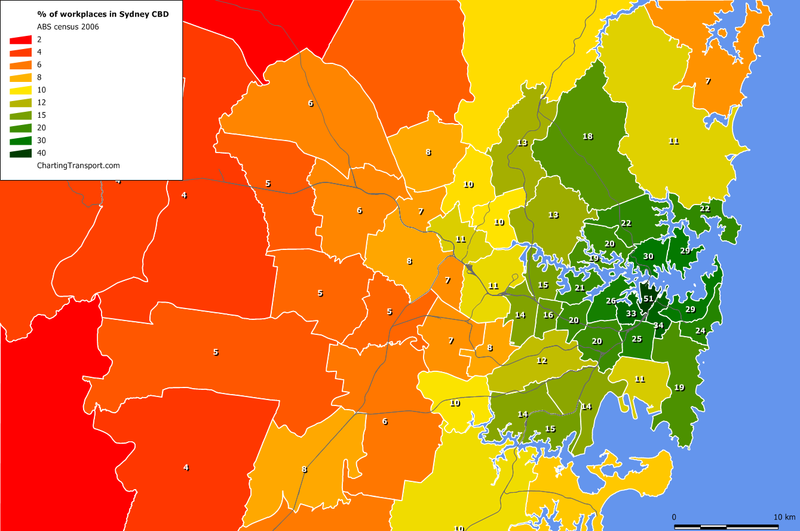 The following map also uses the different scale, and I have zoomed into the areas with significant bicycle mode share. 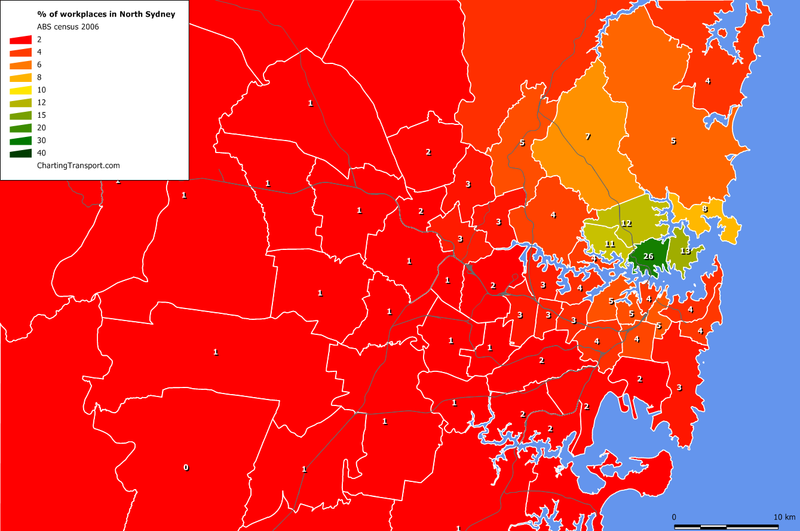 The cycling mode share peaks at 11% from a pocket of Enmore, and seems to be the domain of the inner southern suburbs. 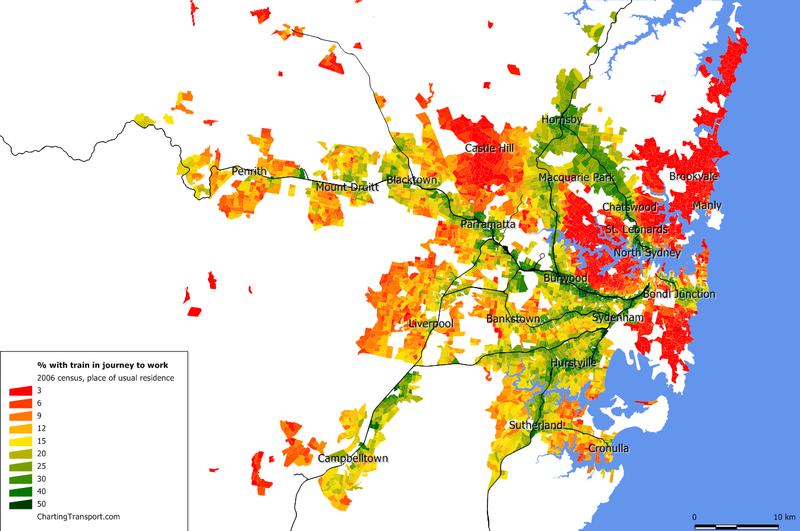 You can see the walking/cycling hot spots are around the CBD, North Sydney, Parramatta, Chatswood, Liverpool, Penrith, and around Randwick/UNSW. (these are the highest value recorded by any travel zone in each centre). By contrast, analysis of destination mode share for Melbourne showed all major suburban centres to have well less than 15% public transport mode share (most less than 10%). Public transport mode share was also quite clearly higher along the train lines – particularly in the middle and outer suburbs. 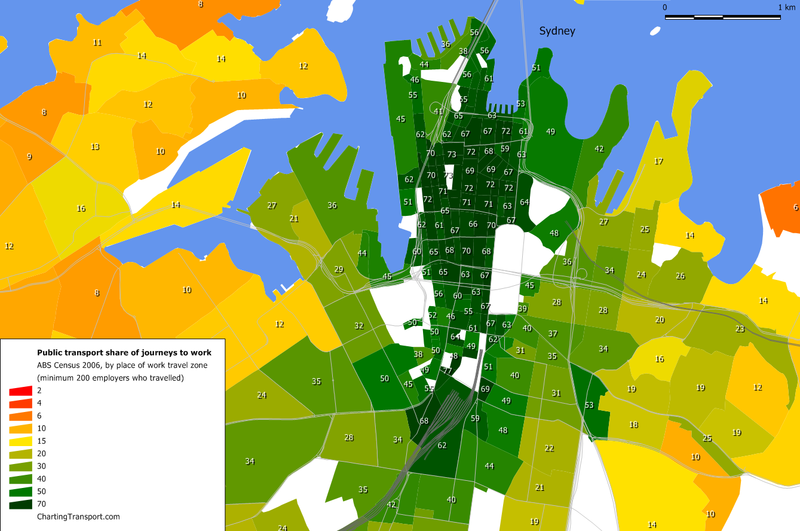 Active transport was most commonly used to inner city areas including Newtown, Camperdown, Bondi Beach, Randwick, Paddington and Potts Point. However it was low in the Sydney CBD. The Holsworthy Military Camp as a large green area in the south with high active transport mode share – probably because the military staff live on site. 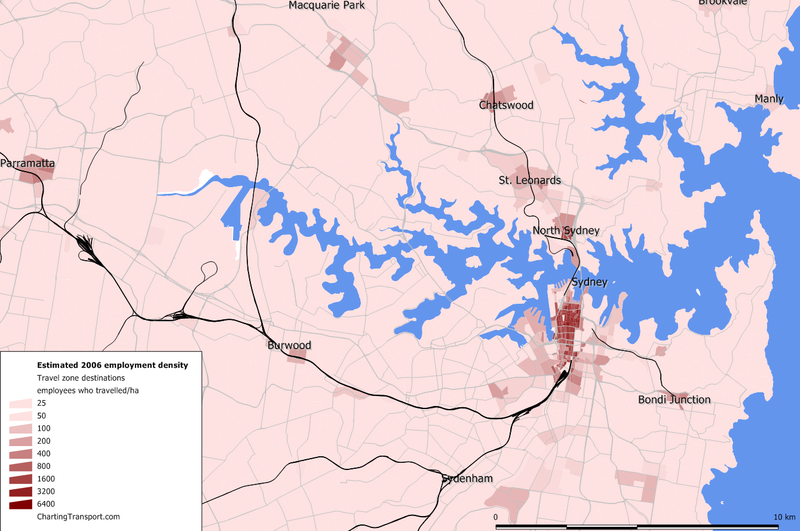 People more familiar with Sydney might be able to comment further. Here is sustainable transport mode share (public transport and active transport combined, everything else being private motorised transport). 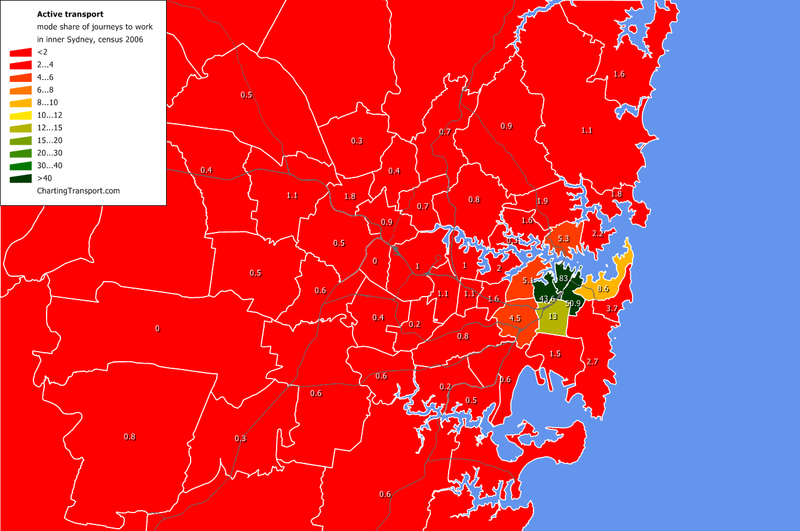 You can see that private transport was by far the dominant for western Sydney jobs. Public transport had a mode share around 70-80% for large areas of Sydney (in contrast to Melbourne where 60-70% was more common). However there was a much lower share from the CBD itself and areas adjacent. Were they walking or cycling instead? Sustainable mode share is highest from the western and south-western suburbs, whereas many people chose to drive from the northern suburbs, the southern coastal areas, and even the inner eastern suburbs. 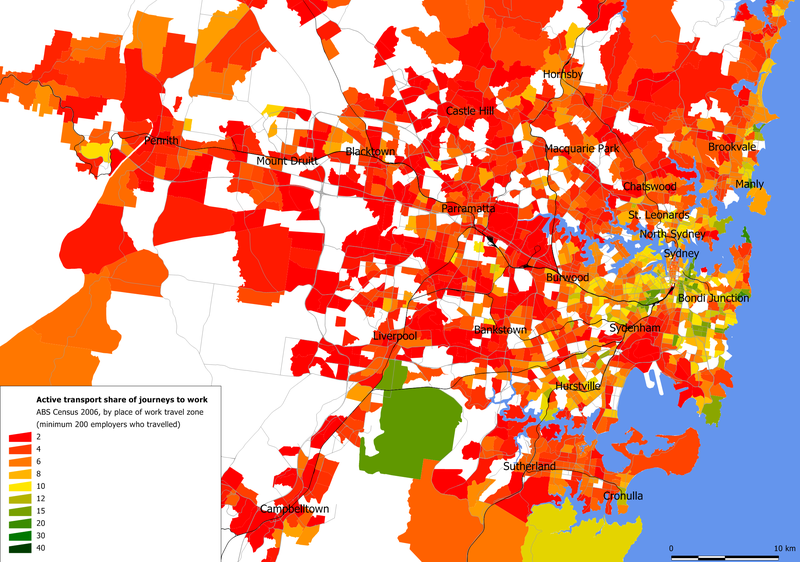 But what proportion of the working population commuted to the CBD? Compared to the Melbourne CBD, the Sydney CBD seems to have a stronger role, even though Sydney has major employment centres outside the central CBD. The BTS data also allows the construction of an employment density map. I’ve drawn this map based on people who travelled to each destination zone on census day. Finally. 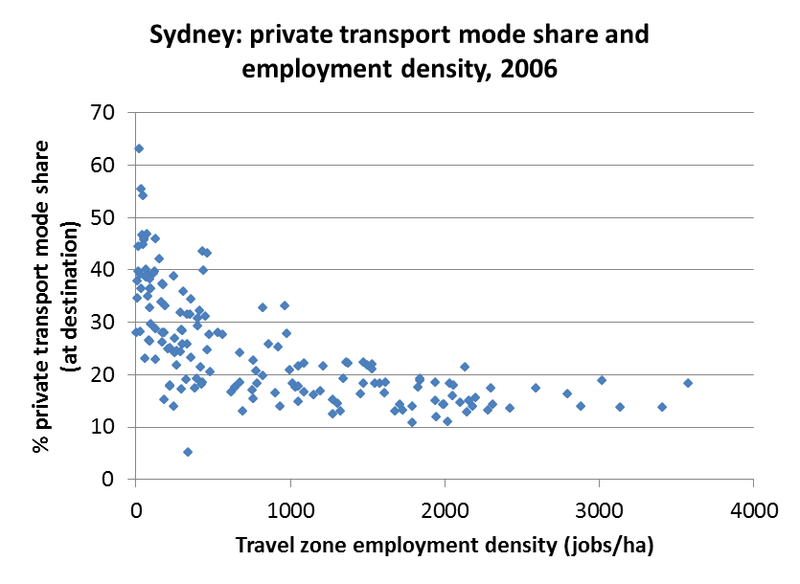 here is a look at the relationship between employment density and public, active and private transport mode share (by workplace zone). 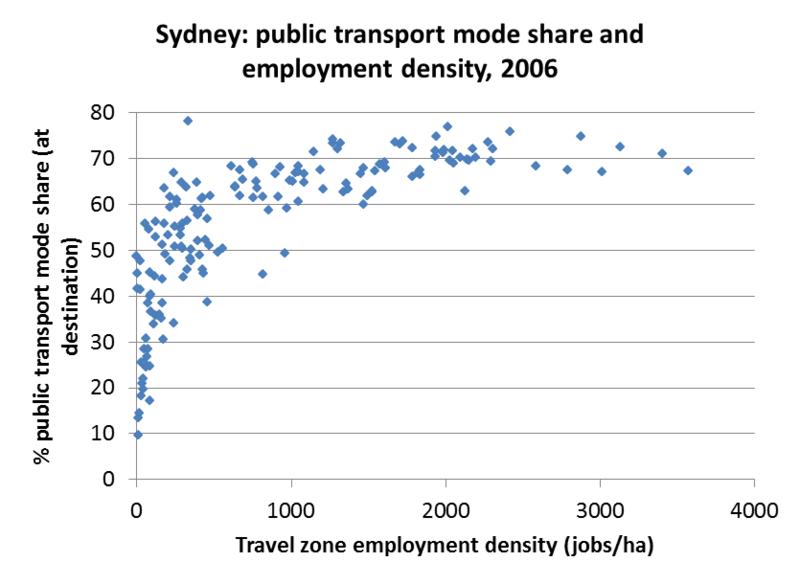 I must stress that these results will strongly reflect the design of public transport – which is heavily geared towards places with high employment density (such as the Sydney CBD) as that is where public transport can generally complete strongest with private transport (the cost of parking and traffic congestion etc). By increasing employment density in any parcel of land you won’t automatically get high public transport mode share – you have to provide high quality public transport to that destination first! Was that what you expected? 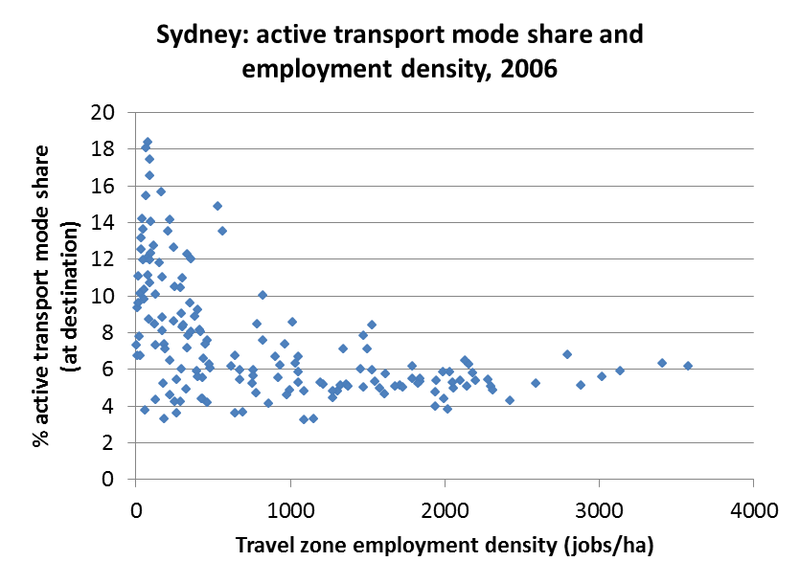 Active transport actually had the highest mode share in areas with the lower employment densities. These are likely to be mixed residential/employment areas where employees can live close by, military camps, and farms. Finally, it will be little surprise that the lower employment densities had the highest private transport mode shares. These areas are likely to have ample room for free employee parking, and public transport is likely to struggle to efficiently deliver a small number of employees over a large area. This entry was posted on Friday, October 26th, 2012 at 9:36 pm and is filed under Employment density, Mode share, Sydney. You can follow any responses to this entry through the RSS 2.0 feed. You can leave a response, or trackback from your own site. 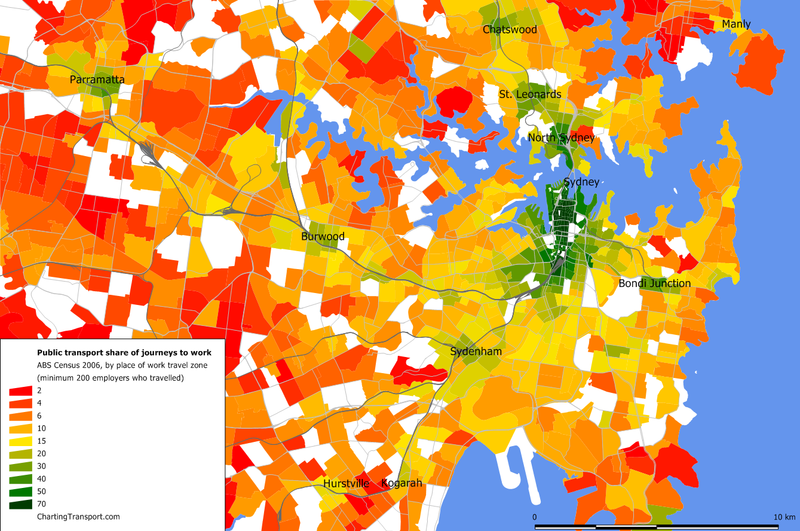 4 Responses to How did Sydney get to work in 2006? 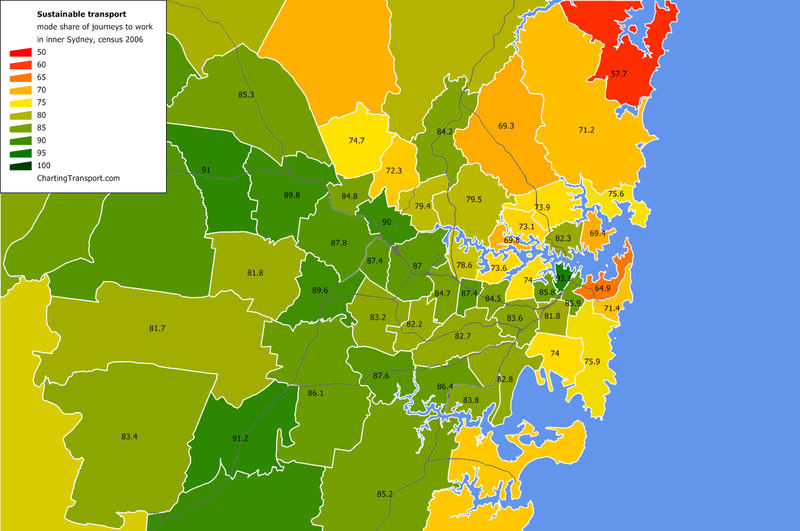 How come the Sydney post doesn’t include 2011 data, like PER, MEL & BNE? That would be quite interesting. I’m hoping to get to that soon. 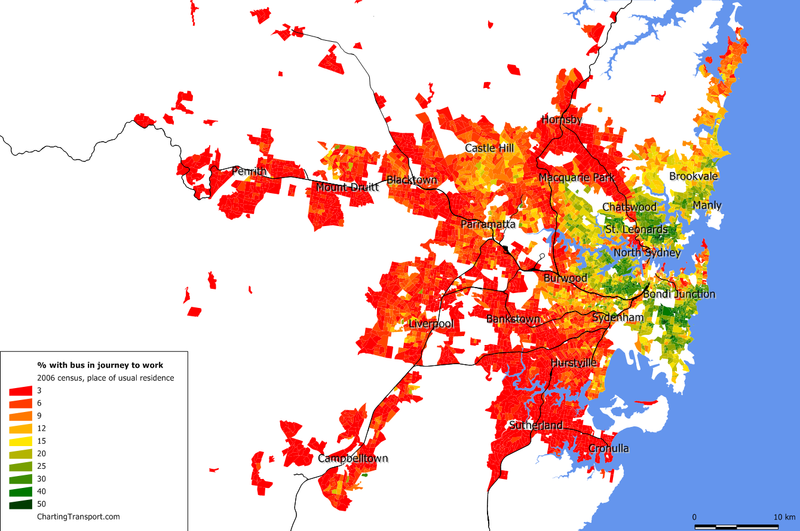 Great blog but I’d also be interested in graphs of sustainable transport % by home location for those working in Parramatta, Chatswood, St Leondards and North Sydney for 2006 & 2011. So 8 graphs. Particularly interesting would the growth in the PT use for LNS destinations.